Several Native American tribes have passed down legends of a race of white giants who were wiped out. 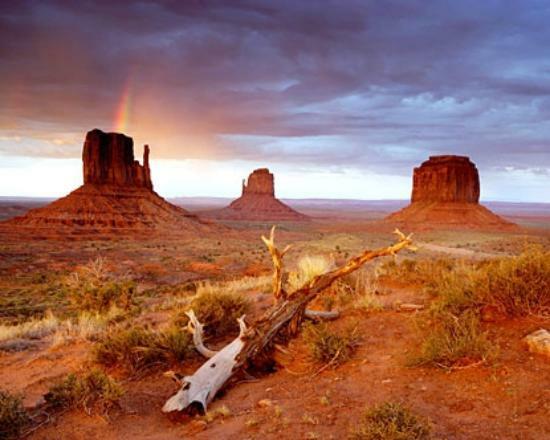 Several Native American tribes have passed down legends of a race of white giants who were wiped out. We’ll take a look at a few such legends, including those among the Choctaw and the Comanches of the United States down to the Manta of Peru. The tradition of the Choctaws told of a race of giants that once inhabited the now State of Tennessee. Cushman said “Nahullo” came to be used to describe all white people, but it originally referred specifically to a giant white race with whom the Choctaw came into contact when they first crossed the Mississippi River. The Nahullo were said to be cannibals whom the Choctaw killed whenever the opportunity arose. Over 200 Giant digs have been found in recent years. 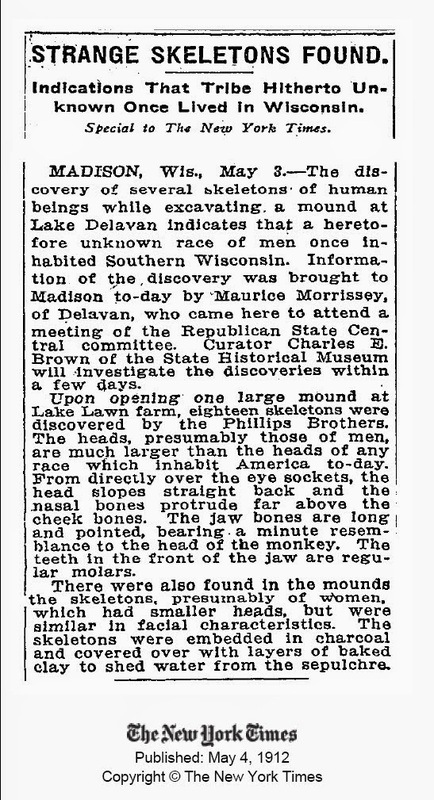 Giant skeleton finds have not made the local/national news since the 1950’s for the most part. It seems in most peoples opinion do to the fear that people would question evolution. If anything a de-evolution. 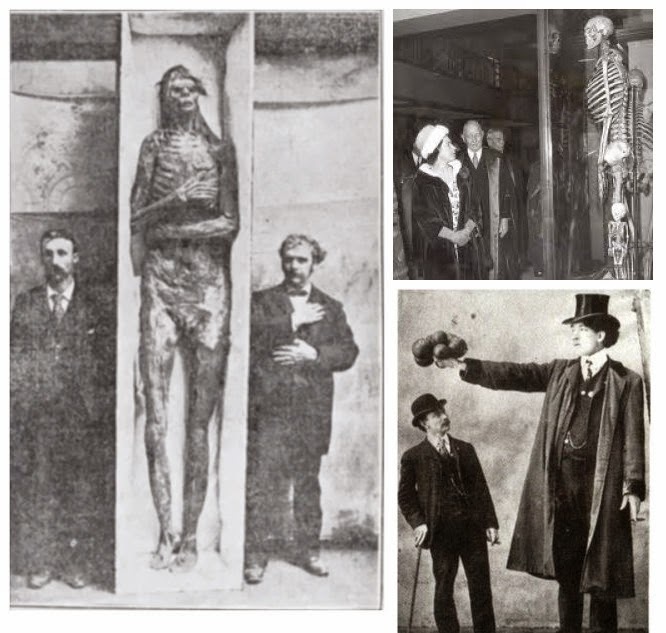 American Giants (Red Hair Giants) where found with egyptian writing on their tombs have been found in multiple locations. the Great Pyramid (Kheops pyramid). The announcement comes at the end of a two-week project to scan Egypt’s main pyramids in order to identify the presence of unknown internal structures and cavities. Called Scan Pyramids, the study is in its first stage and is carried out by a team from Cairo University’s Faculty of Engineering and the Paris-based organization Heritage, Innovation and Preservation under the authority of the Egyptian Ministry of Antiquities. Pyramids are one of the wonders of the world. But why were they built, and why did humans STOP building them? Trace answers these questions and looks at some of the most amazing pyramids from South America to Egypt. Climate change, violence and disease played a key role in the collapse of the Harappan civilization more than 3,000 years ago, according to a new study. This is an artist’s reconstruction of the gateway and drain at the city of Harappa. Image credit: Chris Sloan. Harappan civilization, or the Indus Valley civilization, developed in the middle of the third millennium BC, at the same time as contemporaneous civilizations in Egypt and Mesopotamia. It stretched over a million square kilometers of what is now Pakistan and India. The city of Harappa and the city of Mohenjo-Daro – the greatest achievements of this culture – are well known for their impressive, organized layout. Recent excavations have demonstrated that the cities grew rapidly from 2200-1900 BC, when they were largely abandoned. “The collapse of the Indus Civilization and the reorganization of its human population has been controversial for a long time,” said Dr Robbins Schug of Appalachian State University, who is the lead author of the study appearing in the open-access journal PLoS ONE. Dr Schug and her colleagues examined evidence for trauma and infectious disease in the human skeletal remains from three burial areas at the city of Harappa. Their findings counter longstanding claims that the Harappan civilization developed as a peaceful, cooperative, and egalitarian state-level society, without social differentiation, hierarchy, or differences in access to basic resources. This is an artist’s reconstruction of Mohenjo-Daro. Image credit: University of Minnesota. The results suggest instead that some communities at Harappa faced more significant impacts than others from climate and socio-economic strains, particularly the socially disadvantaged or marginalized communities who are most vulnerable to violence and disease. This pattern is expected in strongly socially differentiated, hierarchical but weakly controlled societies facing resource stress. The study adds to the growing body of research about the character of Harappan society and the nature of its collapse. “Early research had proposed that ecological factors were the cause of the demise, but there wasn’t much paleo-environmental evidence to confirm those theories. In the past few decades, there have been refinements to the available techniques for reconstructing paleo-environments and burgeoning interest in this field,” Dr Schug said. December 18, 2013, 2:33 p.m.
A 50,000-year-old toe bone found in a Siberian cave is giving scientists a surprising view of the breeding habits of early humans. In what has been described as a “Lord of the Rings”-type world, researchers say that Homo sapiens, Neanderthals and two other groups of early humans mingled and interbred thousands of years before all species but ours became extinct. The findings were presented Wednesday in the journal Nature by a team of scientists who sequenced the DNA from the Neanderthal toe fossil and compared it to the genomes of 25 present-day humans, as well as the genome of a sister group to Neanderthals called Denisovans. According to their analysis, Neanderthals contributed roughly 2% of their DNA to modern people outside Africa and half a percent to Denisovans, who contributed 0.2% of their DNA to Asian and Native American people. The biggest surprise, though, was the finding that a fourth hominin contributed roughly 6% of the DNA in the Denisovan genome. The identity of this DNA donor remains a mystery. Geneticists and anthropologists said the inch-long bone and resulting analysis have greatly illuminated a period of time roughly 12,000 to 126,000 years ago. Dr. Annalee Newitz is an editor of i09, was a lecturer at UC Berkeley, a policy analyst at the Electronic Frontier Foundation, a journalist at Wired, and author of ‘Scatter, Adapt, and Remember’. Book review: Will humans survive climate change? 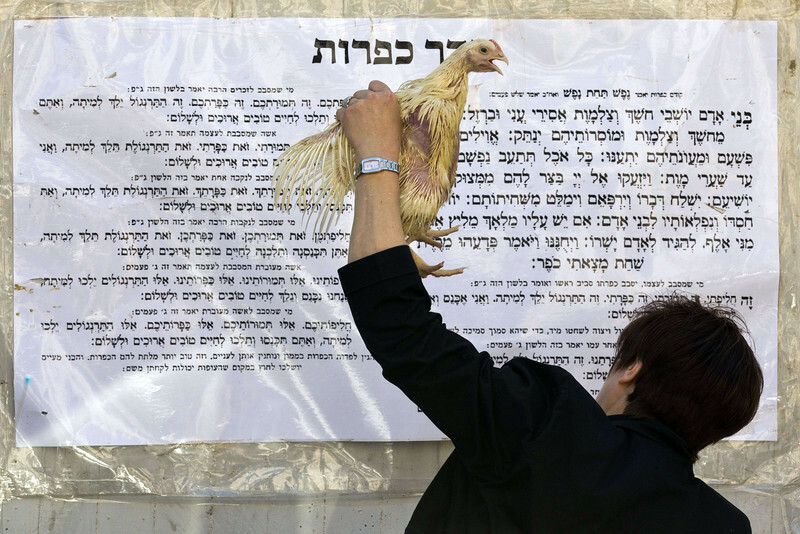 Religious Animal Sacrifice : Animal rights activists and some liberal Jews have protested the practice of kaparot, in which chickens are slain. Interesting, Yoruba/ Santeria ( referred to as Christian Voodoo) Pagan rituals in honor of their Deities also believe in ritualistic blood sacrifice for illness, sins, etc , etc , who knew…. Killing of chickens in Jewish ritual draws protests in L.A.
September 11, 2013, 6:47 p.m. In a parking lot behind a Pico Boulevard building, inside a makeshift tent made of metal poles and tarps, a man in a white coat and black skullcap grabs a white-feathered hen under the wings and performs an ancient ritual. He circles the chicken in the air several times and recites a prayer for a woman standing nearby whose aim is to symbolically transfer her sins to the bird. The young man then uses a sharp blade to cut the hen’s throat. 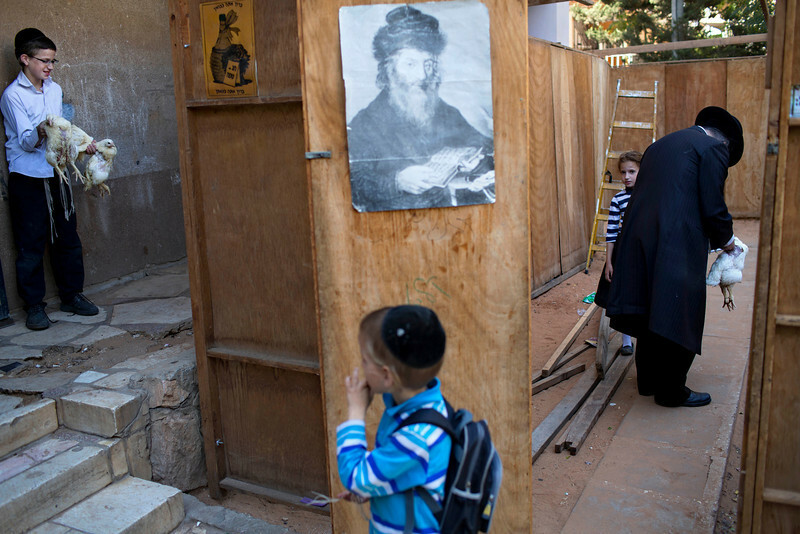 In the days before Yom Kippur, the Jewish Day of Atonement, this ritual will be repeated untold times in hastily built plywood rooms and other structures in traditional Orthodox Jewish communities from Pico-Robertson to Brooklyn. Promotional fliers on lampposts in this neighborhood advertise the kaparot service at $18 per chicken or $13 apiece for five or more. But the practice is increasingly drawing the ire of animal rights activists, and some liberal Jews, who say the custom is inhumane, paganistic and out of step with modern times. This year, activists have launched one of the largest, most organized efforts ever in the Southland to protest the practice, known variously as kaparot, kapparot or kaparos. Over the weekend, a coalition of faith leaders and animal rights proponents held a “compassionate kaparot ceremony” during which rabbis used money rather than chickens for the ritual, an accepted alternative. Organizers say that more than 100 people attended and that some stayed to demonstrate late into the night. 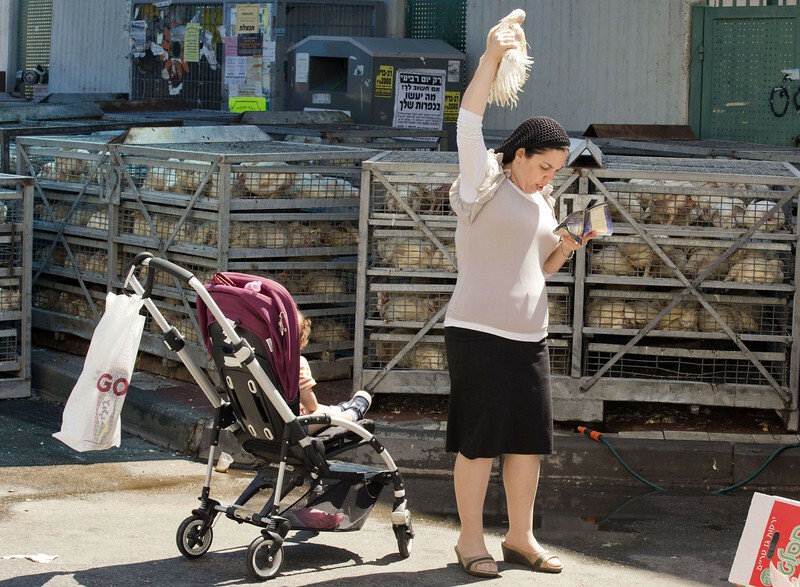 Swinging chickens over the head is part of the Ultra-Orthodox Jewish Kaparot ritual in the Ultra-Orthodox city of Bnei Brak near Tel Aviv, Israel,Wednesday, Sept. 11, 2013. 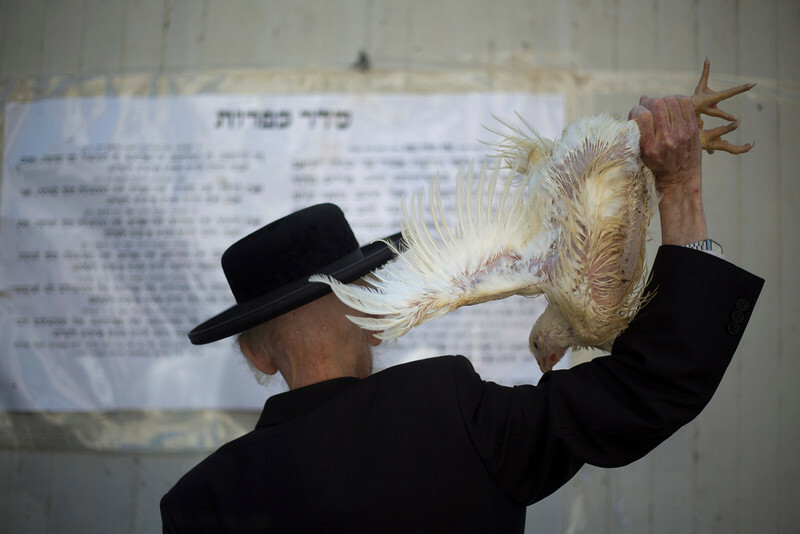 Observers believe the ritual transfers one’s sins from the past year into the chicken, and is performed before the Day of Atonement, Yom Kippur, the holiest day in the Jewish year which starts at sundown Friday. A court case forced a Santeria priest to reveal some of his religion’s secrets. Its ritual of animal sacrifice, he revealed on his own. The Euless neighborhood is mostly quiet, a sleepy suburb of pleasant ranch-style homes, winding creeks and mossy oaks that looks as if it could have been plucked from any American city. Except, of course, for the ancient gods that populate the home and religion of one of the area’s most controversial residents. 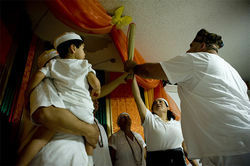 Inside Jose Merced’s shrine room, devotees of all ages participate in the cleansing ceremony for Virginia Rosario-Nevarez as part of her seven-day initiation into the Santería priesthood. The deities, or Orishas, communicate through cowrie shells, telling one woman about her past, present and future in a divination reading. 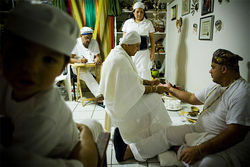 A Santería priest performs the cleansing ceremony on Nevarez (center) before 60 or so deities, which sit in pots on the shelves to her left. 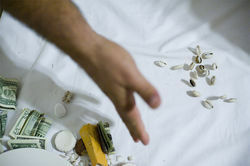 Money is part of the ritual offering to the Orishas during a cowrie shell reading. Web extra: More photos from the feast day at Jose Merced’s home. But Jose Merced doesn’t shy away from controversy—and he has no plans of doing so on this crisp day in late September. 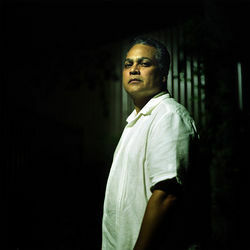 No matter that his neighbors remain uneasy with the ritual singing and drumming that are part of his Santería religion; no matter that they might, as before, call the police if they feared he was engaging in animal sacrifice; no matter that the city of Euless, even after losing a drawn-out lawsuit that tested the boundaries of religious liberty in Texas, is still searching for new ways to shut down Merced’s spiritual practices. For him, the deities who reside in the back room of his house have been silenced long enough. It’s been nearly three and a half years since he stopped the ritual slaughter of four-legged animals in his home to pursue litigation against the city over his right to do so. With a decision from the 5th U.S. Circuit Court of Appeals in his favor and against the city’s health and safety concerns, Merced, a flight attendant, will resume his full religious practices tonight. As the sacrificial hour approaches, several priests (Santeros) are preparing the 40 assorted goats, roosters, hens, guinea hens, pigeons, quail, turtle and duck who grow noisy and nervous in their cages. Their lives will be taken in an exchange mandated by Olofi, Santería’s supreme god and source of all energy, to heal the broken body and spirit of Virginia Rosario-Nevarez and to initiate her into the Santería priesthood. No medical doctor has been able to alleviate her suffering—the intractable back pain that makes walking unbearable, her debilitating depression and loneliness. During a spiritual reading, lesser deities have told Merced that for Nevarez to be healed, she must become a priestess. In the initiation ceremony for priesthood, a high priest will sacrifice animals, which must die so she can live a healthy and spiritual life. In a theology similar to Christian grace in which Jesus died to forgive the sins of his followers, the animals will be offered in sacrifice to Olofi and the other deities (Orishas), who will purge her of negative energy as she makes her commitment to them. Mounted against a wall in the back room shrine in Merced’s house are shelves containing clusters of small ceramic pots, ornately decorated and filled with shells, stones and other artifacts—the physical manifestations of the Orishas that reside in the room. To initiate Nevarez as a priestess, new godly manifestations of the old gods on Merced’s shelf must be born. To make this happen, animal blood will be spilled onto new pots, which the priestess will take home to begin her own shrine with her own newly manifested gods. Much of theology behind Santería’s rituals remains unknown to Nevarez, though more of its secrets will be revealed to her as she grows in her commitment. Secrecy defines the Santería religion, which is why estimates, even by its own followers, of the number of its U.S. adherents vary widely between one and five million. The religion’s clandestine nature was also a point of contention during the lawsuit. At trial, the city asked Merced if its health officials could witness a sacrifice to determine if it violated Euless’ ordinances prohibiting animal cruelty, the possession of livestock and the disposal of animal remains, but Merced said only initiated priests were permitted to see one. The exclusion of outsiders stems from the long history of persecution Santería’s followers suffered. Santería came to Cuba from West Africa during the slave trade centuries ago, a peculiar melding of the Yoruba religious traditions of captured slaves and the Catholicism of their masters. Slaves were forbidden from practicing their indigenous beliefs, so they hid that practice from their oppressors, adopting the names of Catholic saints for their Orishas (Saint Peter for Ogun, for example) whose divine intervention they could call upon when seeking protection, health and wisdom. But tonight, Merced has had enough of secrecy. The litigation has taken a toll on his physical appearance. He looks heavier, grayer, worn out. The national media generated by the case, however, has left him more comfortable with the presence of strangers in his house, even with local news trucks parked in his front yard. And this evening Merced is allowing his first nonbeliever to witness an animal sacrifice. “I’m going to let her see one and that’s it,” he says, standing in front of a long, flowing curtain concealing the entrance to his shrine. He is unwilling to listen to any who oppose the outsider observing the ceremony. Some in the shrine raise their eyebrows but return to the task at hand. They figure Merced’s deities are in control today. If he’s allowing the Orishas to be seen by a nonbeliever, then the gods must be OK with it. Merced has recently disregarded other premonitions of danger. Three days earlier in his home, he held a séance for Nevarez in preparation for her priestly initiation. Ten members, all wearing white, gathered inside his converted garage, now a spare kitchen. On top of a white tablecloth sat a crucifix, prayer books, pencils, paper and a fishbowl of water—there to cleanse the spirits from negative to positive. Hanging on the wall were decorative hollowed-out gourds, painted in primary colors to represent a handful of the 60 or so Orishas in Santería. In one corner sat a life-size female black doll dressed in a flowing skirt and bandanna, a half-empty bottle of rum and lighted candles placed nearby. One of the Santeros at the table knotted his face, his expression troubled. He began to grunt and take short breathes, acting possessed by the spirit, which came alive through him and asked for some rum. A woman handed him a gourd brimming with white Bacardi. As he gulped the rum, he walked hastily toward Merced. This was a negative spirit, and it had a message: It would be best for Merced to leave the area or send everybody away from his home and remain alone. Merced folded his arms defensively across his chest. Time and again, throughout his legal troubles, lawyers, neighbors, friends and even Santeros had proposed he do the same. Why didn’t he just leave Euless? Worship somewhere else? Why come out and create so much controversy when he could just keep things secret and live in peace like the others? To Merced, this spirit represented an insult to everything he had accomplished. Jose Merced never intended to be the face of Santería in North Texas, although he might argue that it was his fate. He grew up in San Juan, Puerto Rico, and recalls his childhood as happy and stable—that is, until his father left the family. Merced, at 12, felt abandoned and grew physically ill, developing a sharp, chronic pain in his stomach and intestines. A medical doctor suggested exploratory surgery, but his mother wouldn’t hear of it. She had grown up in a home where regular séances took place between family members. When pregnant with Jose, a stranger stopped her in a shoe store and told her she would give birth to a male child on April 20 who would possess the gift of spirituality. Merced was born on April 19 and early on became intrigued with the spiritual realm. After Merced became ill, he asked his mother to bring him to a woman his mother had been seeing for private spiritual readings. Even without him mentioning it, the woman told him about his intestinal pains and his nightmares. Hoping she could cure him, Merced began attending weekly séances at her home. Many of those attending wore colorful, beaded necklaces, and he asked the woman how he could get some. She told him those who wore the necklaces were followers of Santería, and he could only get them when he needed them, not when he wanted them. A year and a half later, she did a reading for him with the deities of Santería and told him it was time. At 14, he donned his collares—necklaces that represented the protection granted by the Orishas. For a short while, Merced, who weighed 210 pounds, began to feel better, but it didn’t last. “Spirits also can bother you when you’re not knowing or understanding what it is you come in life to do,” he now explains. The woman became his godmother in Santería, and she continued to treat him with herbal potions and spiritual readings. Over the next 18 months, he lost 60 pounds and had good months as well as bad. Finally, Merced says that the Orishas spoke through the woman and told her that the only way to make his pain disappear was to get initiated as a priest. Merced was ready, but the ceremony was expensive, $3,000, and he didn’t have enough money. For a year after graduating high school, Merced saved up, working as a clerk for the Puerto Rico Department of Education in San Juan. By early 1979, with his mother’s help, he had saved enough money, though he still had no idea what to expect. On the day of his initiation, he was called inside the shrine and told to keep his eyes closed. Four hours later, he was dressed in regal-looking robes, his head completely shaven. Later he was told he had been possessed by his Orisha, but he remembered nothing. After the crowning ceremony, it was time for the animal sacrifice. As the animals were brought in, he was told to touch his head to the animal’s head and its hooves to other areas of his body. The animal was absorbing his negativity. He had to chew pieces of coconut, swallowing the juice but spitting the coconut meat into the animal’s ear. He would later learn that this was necessary for the “the exchange ceremony,” which came next. The pieces of coconut represented Merced’s message—his thoughts, feelings, needs—which were transferred to the goat for direct passage to Olofi. His physical contact with the animal was also symbolic of his commitment to God. As soon as the animal’s blood was spilled, Merced’s negativity, which had been absorbed by the goat, was released. The purified blood then spilled into the pots. Shortly after the initiation, he says his stomach pains subsided. “I never, ever have felt again the same pain that I used to feel before,” he says. Although he had little contact with his father, a nonbeliever, he invited him to his divination readings two days later. His father also visited him at his mother’s house immediately after the seven-day ceremony concluded. Merced was wearing all-white, his head shaved clean, and his father insisted this was all his mother’s doing—she was the one who had become a priestess a year earlier. His father demanded he end these religious practices and join the National Guard like he had. Merced told him, no: He had become a priest for health reasons, and he refused to let him shake his faith, particularly after his father had been so uninvolved in his life for so long. If his father had learned anything from the divination readings, he would know what the Orishas had in store for his son. The priest had told him he would travel the world. He told him he would become a priest who would initiate others. And he told him that people would have reason to remember his name. The first year of his priesthood was a difficult one. At the department of education, many of his co-workers would shoot him strange, even hostile glances when he wore his necklace and dressed in the all-white attire his religion required him to wear in the year following his intiation. In 1989, he learned about a job opening with a commercial airline, and the next year he began to work for the company in Dallas. The work was good, but his spiritual life suffered. A closet in his apartment in Euless served as the shrine for his Orishas, which he had brought in cloth bags when he first traveled from Puerto Rico to Dallas. A year after the move, he bought his first home and dedicated an entire room to his deities. Using the Yellow Pages, he located a botanica (a spiritual supply store) on West Jefferson and felt brave enough to introduce himself as a Santero. Here he would find others who shared his beliefs. Over the years, he would become godfather to at least 500 followers and initiate at least 17 priests. As these new priests went out into the community and gave out necklaces to their own godchildren, Merced’s own house grew. He estimates that today there are close to 1,000 believers in his Santería community. In 2002 Merced moved into the house he currently owns in Euless, but it wasn’t until 2004 that he started attracting the attention of the authorities. On September 4, Euless police and animal control officials showed up unannounced at his home. An anonymous caller had complained that goats were being illegally slaughtered in his backyard. When the authorities arrived, Merced was in the middle of a sacrificial ceremony inside his shrine. The police told him to stop—that if he didn’t they would fine him or arrest him. But the animal control officer intervened: Merced was allowed to continue the ritual and would not be arrested, at least not that day. An international team of scientists from Switzerland, Australia, Germany and the United States has discovered remains of three hunter-gatherer settlements in the western Amazon. This map shows location of three hunter-gatherer settlements in the Bolivian Amazon: the site of Isla del Tesoro – SM1, a site west of the Mamoré River – SM2, a site east of Trinidad – SM3 (Lombardo U et al). Their study, reported in the open-access journal PLoS ONE, focuses on a region in the Bolivian Amazon thought to be rarely occupied by pre-agricultural communities due to unfavorable environmental conditions. Hundreds of ‘forest islands’- small forested mounds – are found throughout the region. Their origins attributed to termites, erosion or ancient human activity. The team reports that three of these islands are shell middens, mounds of seashells left by settlers more than 10,000 years ago. Samples of soil from these mounds revealed a dense accumulation of freshwater snail shells, animal bones and charcoal forming the middens. Eight Steps to Empire: The Culture Wars is a documentary exploring the concept of empire in the modern era. The film looks at the usage of diversion and cultural subversion as mechanisms of social control. This 24-minute excerpt from the film is submitted as part of InfoWars.com’s Operation Paul Revere Contest (www.infowars.com/contest). Originally scheduled for release in Spring 2011, the film’s release date has been pushed back due to a lack of funding. Production has been slow as the movie is being produced by a single person working on a $500 desktop computer. Thank you for your support. Please share. FAIR USE NOTICE: This video contains copyrighted material the use of which has not always been specifically authorized by the copyright owner. All use of copyrighted material in this material is for the non-commercial purpose of social, political, and cultural critique, and intended to be educational. We believe this constitutes a ‘fair use’ of any such copyrighted material as provided for in section 107 of the US Copyright Law. In accordance with Title 17 U.S.C. Section 107, the material in this film is distributed without profit to those who have expressed a prior interest in receiving the included information for research and educational purposes. Where did the culture wars come from? this is a 6-part Epic film that shows how Europeans actually made the migration thousands of years ago. There was no conspiracy by scientists to fabricate the information. Rather instead, the discoveries were independent from one another. And, the results were often discovered accidentally. 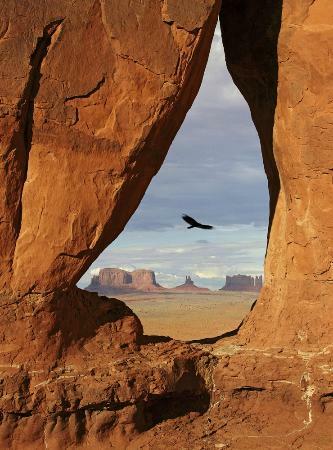 This video is Not intended to erase the status of Native Americans throughout North America. Not intended as a challenge or belittling of other races as this is not race related , but scientific. Information that had not been known before and has set the record straight. The first Europeans that set foot in North America were not the Explorers that history has claimed for so very long. Europeans existed on this continent for thousands of years longer than current history reflects according to this discovery. Or so it seems…… very interesting findings in this video. White Native Americans – Where the first Americans Whites? “It is my intention that these videos promote the frank and open discussion of the ancient history of the Americas. Identity politics has no place here. I simply wish to connect the dots of research findings which now tells a very different story than we were taught as children. You will see that the citations offered in this video series come from many mainstream universities, as well as the Smithsonian Institution. Virtually every idea is sourced, as you can see in about 9 minutes in the Summary chapter. The peopling of the Americas appears to be much more complex than we initially thought – and more interesting. “First Americans – Out of Europe” does not mean to imply that this is the last word on the “first Americans” but that of the very early migrants to the Americas, Europeans were part of this group. The earliest evidence now points in their direction. These people have a right to have their story told, as it will be ignored in the current PC dominated boring old media. The picture is sure to change as research continues to come in. These are cool times in this area of science. A tiny robot called Tláloc II-TC, which has been scanning tunnels deep beneath the famous temple, found the orbs using infrared scanners. The Tláloc II-TC is named after the Aztec god of rain. It is three-feet-long and can squeeze through tight spaces and explore small, hidden areas. It is fitted with video cameras and a mechanical arm used to clear obstacles out of its way. 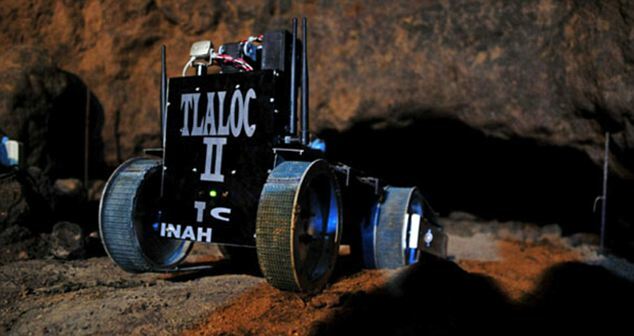 It is part of a robotic system called Tlaloque, which includes a large rover that carries the two smaller robots. Once the Tlaloque arrives at a chamber, the robots break off and scan the area using infrared scanners. A separate flying drone captures video footage. 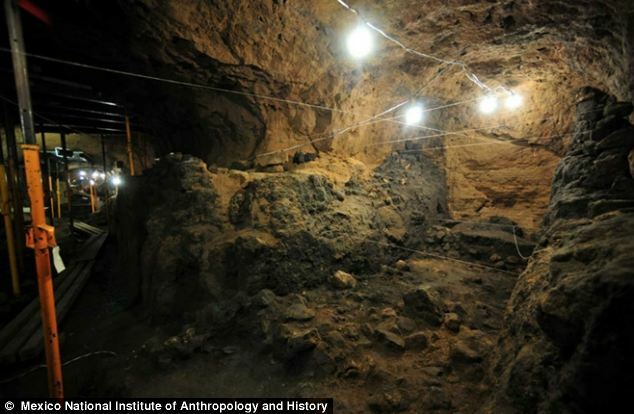 They were hiding in a previously unexplored ancient chamber at the end of a stretch of 2,000-year-old unexplored tunnel on the Teotihuacan site, near the Pyramid of the Sun. 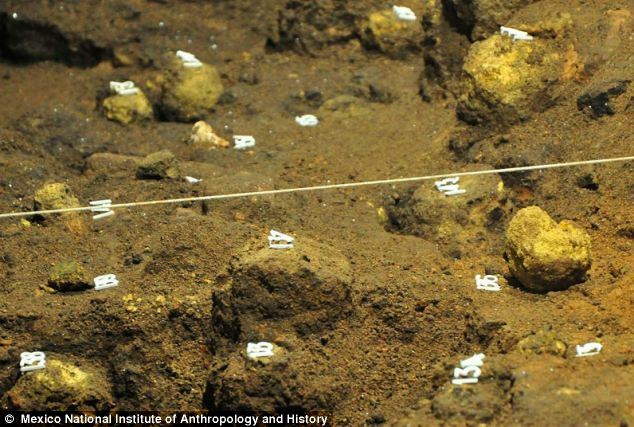 Jorge Zavala, an archaeologist on the dig said: ‘They look like yellow spheres, but we do not know their meaning. The spheres are made of clay and range from 1.5 to 5 inches in circumference. They get their yellow colour from a material called jarosite. Lead archaeologist Sergio Gomez explained that the spheres appear to be made of metal because jarosite is formed by the oxidation of pyrite, which is a metallic ore also known as Fool’s Gold. The walls in the chamber were also found to be dusted in pyrite, which gave it an appearance of a gold room. The archaeologists therefore think that the orbs would have been used by ‘high-ranking people, priests, or even rulers’ to perform rituals within the tunnels. Although, the team admit what part they played in these rituals, and what these rituals meant remain a mystery. The team from the Mexican Institute have been using the robot for months to explore the tunnels under the celebrated temple, also known as the Temple of Quetzalcoatl. 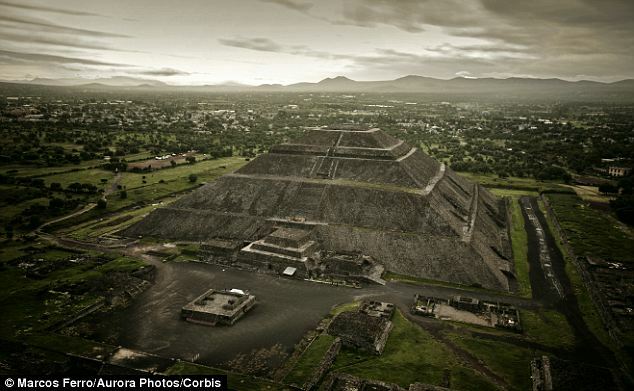 Teotihuaca means ‘the place where men become gods’. The site is thought to be a burial ground. The Teotihuacan people worshipped eight gods, and were known to carry out human sacrifices. The ancient city was founded 2,500 years ago and was once one of the biggest cities on Earth with over 100,000 residents – Earth at this time only house 200 million people. The city was totally abandoned in 700 AD and very little is know about the civilisation, or what caused the mass exodus. The temple lies about 37 miles north of Mexico City and the site houses the remains of the pre-Hispanic city of Teotihuacan in the Basin of Mexico. It is best known for the towering Pyramids of the Moon and the Sun. 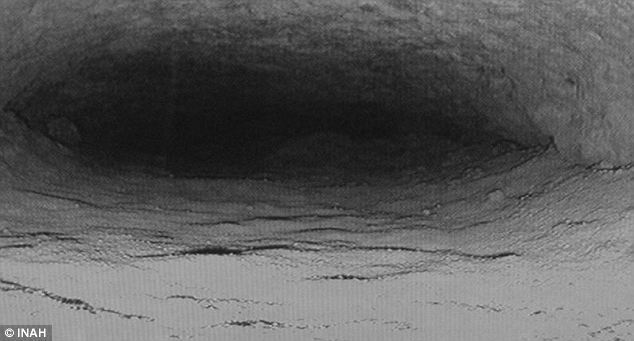 Earlier this year, the team and the remote-controlled robot found three unexplored passages. It was only expected to find one. The discovery of the hidden passages and golden orbs could be highly important.